So a few weeks ago - I brought up some book recommendations. 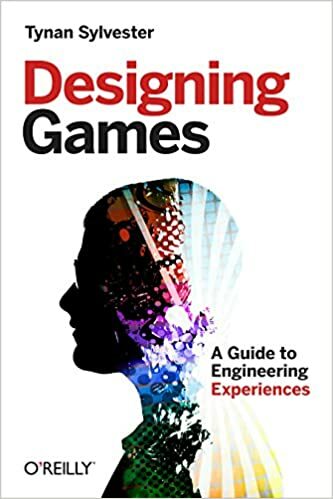 I have finished and have reflected a fair bit on Tynan Sylvester's book - Designing Games: a Guide to Engineering Experiences and I am ready to give you my views on it. The book is very insightful on the idea of designing games - it talks a fair amount about the practical elements but it's stronger side I feel like was the approach to game design itself. Going into the book - I already had an idea of how I would approach game design; even not having read any books on game design - I had an idea of how I would love doing it. I was pleasantly surprised to find that this book built on the same approach I had. Moreover, it built and added more onto it. The approach taken by the book to explain game design is that you as a designer are meant to create a way to develop experiences for the user. I don't want to speak too much of it - as the book does a splendid job on doing just that; however the book also covers aspects of managerial considerations for game designers and motivation. The book is full of insightful examples that help to show how the various concepts and models presented can be used in a practical manner. Perhaps the element that struck me the most was how in each paragraph or section - important notes are given precedence. These elements were singled out in a particular paragraph - in bold; and served as a highlight of an important concept or element. Often times - these were the elements I noted for my future reference in a notebook outside of my personal notes; as they seemed to bring up some of the most important points in the topic at hand. Hopefully I gave you a good idea of whether this book is something you'd want to look into. I would personally highly recommend it. The information it provides is given in a clear and concise manner. Diagrams and examples help to illustrate much of the models and ideas put forward by the author. 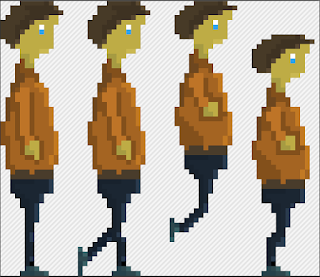 So today I wanted to show you some more work I've done on pixel art - more specifically character states. I am quite pleased with the turn out - but there is much more to improve on. I used one of my older characters - bringing them more to live with different states! Some aspects I feel like could use some improvements is the sword - perhaps even adding a small bend to the waste to make the character feel more flexible. However overall - it turned out rather nicely. Next is a ledge grabbing state - the reason for this state is because in the game I will be testing this character in - the character will be able to grab onto ledges to climb! Similar to the jumping state - I decided to bring the foot a bit forward to show the character holding onto the wall. I felt like bring the sword in as well helped with this. Finally - this isn't a state per se; it is an attack the character will be able to use. I feel like that these were definitely an improvement over my last attempt at creating different animation states. The character feels more natural and looks far far better performing these actions than my previous attempt! I can't wait to see these in-game and see how they turn out after a few tweaks and improvements! So this week I will be speaking at a local Youthspeak Forum event - organised by AISEC Malta. I will be speaking about entrepreneurship - however I chose to focus on what often is under looked at when talking about the topic. That is the entrepreneur themselves. I think most of us heard the term that investing in yourself is possibly the best investment you could possibly make. That argument holds ground due to the one simple fact - that no matter where you are in life, at any point; what is common from your past to your future - is that you yourself are there. This means your skills, ideas, personality, abilities, weaknesses - all these things are there. More importantly - your mindset is there. The implication of this is a bit stronger than a lot of people seem to care to believe. Focusing a lot on qualifications within many educational systems tend to reinforce this - but often what differentiates the entrepreneurs is their mind-set tends to be very different than that of others. I speak for myself - switching mind-sets is difficult, but not impossible. In my case - I did it over a course of a few months, always building and improving myself in the ways I believed would be beneficial. However when we talk about mind-set it goes a little bit deeper than that. Mind-set in terms of - in your every day choices, do you pick the easy way out even if it's not great? Are you willing to push through the hard obstacles presented to you - even if you have no support? Are you willing to not let anything push you down - even when it seems like nothing can possibly pick you up? The answers to these questions seem obvious - though in the day to day life, they can be as little and as large as we can image. Simple things like - going to the gym or exercising over sitting down and doing nothing. To large things like - pushing my dream and vision over following a plot that was readily paved for an easier time but a career I did not actually want. In a fair amount of countries - European at the very least, there has been a large emphasis on supporting start-ups. More than that - the environment of the market as is rewards it to a certain extent. E-commerce in many ways created a vast open market that many enterprising individuals can benefit from. Moreover, certain industries (we talk about game development often here) have had the tools required become fair more accessible and fair cheaper. You can go online today - download a number of game development tools and get to it. So why is entrepreneurship still seems like it needs a boost? Well - the way I see it, as someone pursuing it personally, as well as having studied and read on other entrepreneurial individuals. The opportunities definitely help - but the ultimate basis is the individual. The individual is the entrepreneur - and whilst providing opportunities will help - I think the truly determining factor of entrepreneurship comes from the individual themselves. Which can be taken in two ways. One, the opportunities and support given are valueless (which is not true) or two - which is how I see it: that the individual is empowered to forge their own path. Empowering the individual is key to entrepreneurship. So my advice to those pursuing entrepreneurial dreams - make sure you do not neglect yourself. It may seem like funding, ideas, support, opportunities and so on are the essential aspects; but you yourself, are the essential aspect. Your mind-set and perspective is extremely important; as well as your skills and abilities. So this month I decided to refocus my attention onto the Game Maker Engine. Whilst the engine does not use Java for coding - I had gained some insight into how to better organise my code and felt like it was a good time to apply it to Game Maker's own coding language. I had already learned and practiced Game Maker; as those of you who read my blog know with the asteroids-type game ICON. So this time around, I'm working on a small platformer. To do this; I am following the udemy course of Hearthbeast Studio's Benjamin Anderson. Since I had previous experience with the engine - the first part of the course is mostly a refresher for me before I get into the new stuff. After the course - I will simply go ahead and re-build the game itself with my own touch. I'll work with making new levels, adding new assets and so on. This way I can gain knowledge by both practice and the tutor's own guidelines. I do encourage you to do the same - it is quite invigorating adding and changing your creation's aspects from your own personal touches. Much of what ICON includes is elements that I myself added - that includes the art, the health and difficulty features as well as the different types of weapons and ammo counts for them. Whilst small - I made those by my own capabilities and that helped me and motivated me to go for bigger achievements during my own practice and experimentations. Benjamin Anderson has a youtube channel, a book on GML coding as well as two courses at the time of writing this article on Udemy which I definitely recommend checking out. If your getting into Game Maker - it is a very good place to start off. I will post images of my progress later on! If you saw my previous pixel art update - the tiles I posted were ones I was thinking of using for the platformer once I get into re-hauling the artwork. Coupled to that I still need to add more tiles to add variety, and a character. Moving from there - I will work on enemies and on improving the interface. Bit by bit, element by element - I will be adding to create something that is personal to me - just as ICON became after I modified and added all the features it has today. 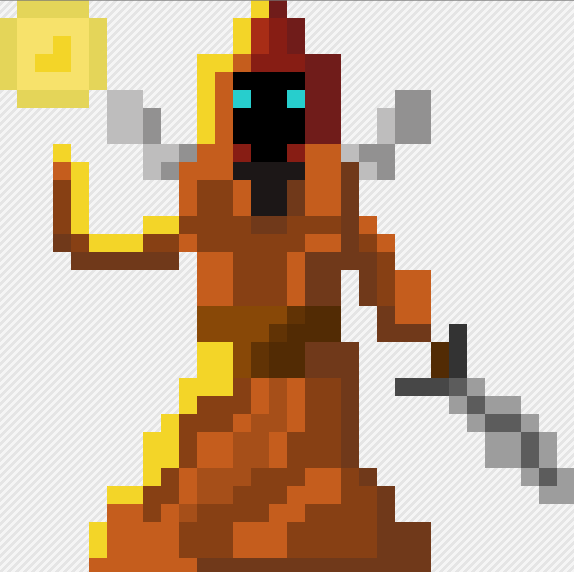 It's been a while since I posted something about pixel art so I decided to do so this week. 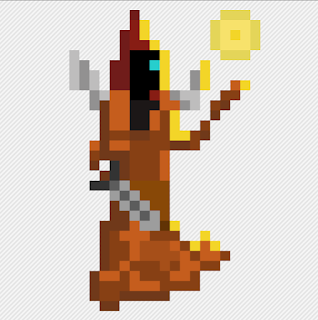 I have done little in the way of pixel art in the past 1 month since my focus was on HTML and Java; however I did make two items I wanted to show. The first is a character I used to experiment and try to practice a little bit of states. I.e. Idle, Walking, Jumping and finally Crouching - or more like hitting the ground again after a jump. The character is simplistic - I tried to not overcomplicate him since I was still going to decide how I would do the various states. For a first attempt - I am fairly satisfied. There are a number of obvious improvements of course - firstly being that the head remains consistently the same throughout. I also worked on a few more tiles. I think if you haven't realised by now; tiles are quickly becoming a favourite of mine. I do need to start adding some complexity however - such as structures. The pillars came out fairly nicely - I hope to eventually add a type of ancient Greek structure and see how that comes out. I'll be sure to post it here when I do!